Sleek, contemporary lines. 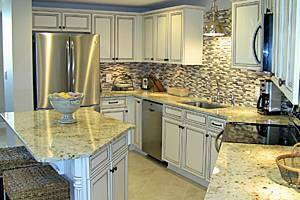 Lighter-colored cabinetry and countertops. Glass mosaic-tile back splashes. These are just some of the most popular new trends adorning new and remodeled condo kitchens along the gulf coast. Nick Zargari, president and owner of Marquis Industries, said most people designing or remodeling condo kitchens are looking for more vibrant or exotic- looking finishes. Another popular approach toward updating condo kitchens is to paint cabinets in light shades, such as sea foam or sea glass, said Lindsay Miller, interior designer at Lovelace Interiors in Destin. “Colored glass or polished nickel door knobs and drawer handles also help achieve the new, lighter, brighter look,” she added. While granite is still the most popular choice for countertops, many people are also choosing to go with lighter shades of white and cream, rather than the blacks and dark greens that were previously very popular, according to Karen Waterfield, interior designer at Sugar Beach Interiors in Destin. Stainless steel continues to dominate when it comes to kitchen appliances, Waterfield said. However, there are many new options being seen in condo kitchens, including shallow-depth refrigerators. 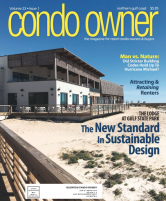 In this issue, Condo Owner takes a closer look at kitchen design and remodeling, the popular design choices now available and the considerations in implementing these trends. Whether your condo is in a brand new building under construction or you are revamping an existing kitchen, there are a number of steps to take before the actual work can begin, according to kitchen design professionals. Nick Zargari of Marquis Industries recommends creating a portfolio, with photos of kitchens you like, using your favorite magazines or pictures taken in places you visit. Karen Waterfield of Sugar Beach Interiors said that kitchen projects usually take at least three months. The planning often takes four to eight weeks, including about two weeks of meetings with the designer to determine details, she said. Then, there is the deconstruction, the final measuring and finally the installation. If you are on a tight budget but want to make some changes, tackle one or two items at a time, suggested Lindsay Miller of Lovelace Interiors in Destin. Replacing an old Formica countertop with a new granite one can make a big difference. Upgrading to new appliances can be more economical if you shop for nice mid-level items rather than the ultra-expensive, top-of-the-line products. And, a new backsplash can have an immediate visual impact, she said. Karen Waterfield of Sugar Beach Interiors in Destin has been designing and remodeling condo interiors for more than 30 years. Her work on kitchens often includes reconfiguring the space to make it more useful and accommodating to the owner’s needs. • Soffit area (the space between the top of the cabinets and the ceiling) can be put to use by cutting into it and adding cabinets or redesigning existing cabinets to fill the entire space, which adds more usable storage. • Wasted space left in corners can be put to use by redesigning the layout of the cabinets. • Custom-designed pantry cabinets with rollout drawers can be installed to increase access, efficiency and ease of use while allowing for more storage. • Ceiling-mounted cabinets between the kitchen and living area and/or foyer closets that block views or create tight, confined spaces can be removed to open up the space and make it brighter. • Areas that aren’t being used can be re-purposed. One client had a wet bar she never used. It was removed to create more seating space in the living room. • Always consult design professionals who will work with building contractors and engineers to determine whether the changes you desire are structurally feasible. One way that Nick Zargari of Marquis Industries helps his clients achieve a sleek, sophisticated look in kitchen design is by installing cabinets that use a thermally fused surface material. Using a frameless (sometimes referred to as European) design, these cabinets provide the smooth, flat surface of the contemporary style. The silver aluminum finish also matches the look of the stainless steel appliances, completing the contemporary, streamlined approach to the kitchen’s design, he added. To subscribe, click HERE or call 1.800.968.0712!